Blue Ridge Energy line technicians have restored a majority of the over 8,000 members impacted by weekend outages related to the remnants of Florence, but crews continue working to access areas off the New River cut off by flooding. As of 11:30 a.m., restoration efforts are underway in: Ashe County, where six members are without power; Watauga County, where two members are without power; and Caldwell County, where 1 member is without power. Over 128 locations of the cooperative’s electric system was damaged from large trees falling outside rights of way due to sustained rains and wind gusts. 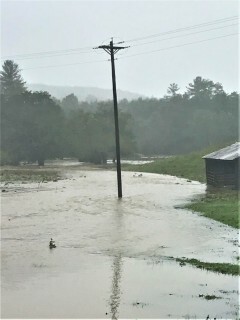 Caldwell County: 1,398 members affected from 23 damaged locations widespread across Lenoir, Hudson, the northwest part of the county including the Globe and Upton areas, Buffalo Cove road, and Dry Ponds area. Watauga County: 4,773 members affected from 30 damaged locations widespread across the areas of Hound Ears, Calloway Mtn Rd, Zionsville, Blowing Rock and Deep Gap. 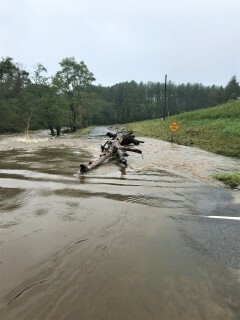 Ashe County: 942 members affected from 48 damaged locations widespread across the areas of Beaver Creek, Warrensville, Creston, Shatley Springs and Obids. Alleghany County: 1,165 members affected from 27 damaged locations widespread across the areas of Glade Valley, Sparta, Chestnut Grove, and Hwy 18 South.